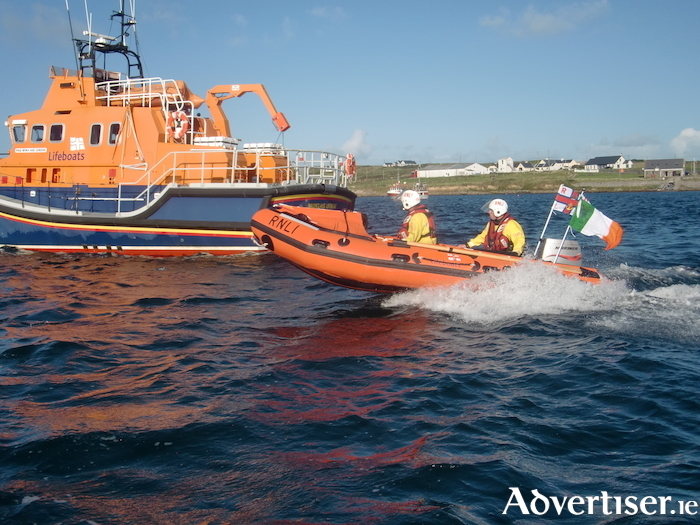 A new D class lifeboat for Ballyglass RNLI is to be officially named Clann Lir, during a ceremony at the inshore lifeboat station at 2pm on Saturday. The lifeboat, which went into service earlier this year, has been funded by a donation from the Central Bank of Ireland. The Central Bank had scheduled the launch of its 2017 Annual Mint Set, which paid tribute to the vital work carried out by the Irish Coast Guard and Irish Lighthouses for March 2017. However, the launch was postponed following the tragic loss of the crew of Rescue 116. Following the tragedy the Minister for Finance agreed that the proceeds from the sale of the Annual Mint Set 2017, be donated to a nominated charity. The RNLI was selected as the main beneficiary of this donation as its work closely aligns with the work of the Irish Coast Guard and the Commissioners of Irish Lights. The new inshore lifeboat replaces The Western, which launched 58 times while on service in Ballyglass, coming to the aid of 20 people. Clann Lir will now serve alongside Ballyglass RNLI’s all-weather lifeboat, Bryan and Gordon, which has launched 152 times since going on service in Ballyglass, with her crews coming to the aid of 153 people, 14 of whom were recorded as 'lives saved'. Pupils in the school were given the task of nominating a suitable name for the lifeboat, that had to be Irish, with either a nautical or community theme. Three names were shortlisted by the volunteers in Ballyglass RNLI before the Central Bank of Ireland picked a fitting winner, Clann Lir. Here they met a monk who baptised them, instantly returning them to human form, but because of their very old age, they died immediately. They were buried on the island in the one grave. Speaking ahead of the naming ceremony, Padraic Sheeran, Ballyglass RNLI Lifeboat Operations Manager stated: "This is a very special occasion for our lifeboat station and we are most grateful to the Central Bank of Ireland for this generous donation which has funded our lifeboat. We will be proud custodians of this lifeboat, which will go on to rescue and save many more lives in the years ahead." The D class lifeboat has been the workhorse of the RNLI’s lifesaving service for nearly 50 years. It is inflatable but robust; highly maneuverable and capable of operating much closer to shore than all-weather lifeboats. It is specifically suited to surf, shallow water and confined locations, often close to cliffs, among rocks or even in caves. First introduced to the fleet in 1963, the design of the D class has continued to evolve since its introduction and the latest version was introduced in 2003. As with all D class lifeboats, the Clann Lir has a single 50hp outboard engine and can be righted manually by the crew after a capsize. Onboard equipment includes both fitted and hand-held VHF radios, night-vision equipment, and first aid kit, including oxygen. The 5m lifeboat is landrover launched and has a 25 knot maximum speed. It can carry up to three lifeboat crew and five survivors.